30 W INTER 2019 PracticeLink.com ▼ T HE Qu AL I T y O f L I f E ISS u E D E P A R T M E N T S PracticeLink Tips CHR i S SC ite S t he case for a narrow job search Being open to any location can send the wrong message to physician recruiters. at a R e C e N t PH y S i C ia N SP e C ialty C o N fe R e NC e , a C lie N t S to PP e D B y t H e PR a C ti C eli NK B oot H to S ay H i a ND offe R S o M e fee DB a CK. As PracticeLink is dedicated to constant improvement, I paid close attention so I could pass the idea along. 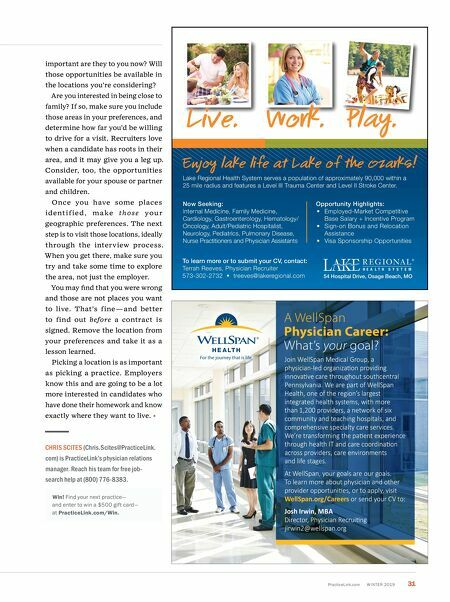 However, this particular client's issue had less to do with PracticeLink and more to do with the physicians who use it— specifically, the way that physicians select the geographic areas in which they're interested in working. C u r iou s, I i n for m a l ly surveyed more physician recruiters and found that most agreed: They hate it when physicians list their geographic preferences as "open u .S. "— meaning you're open to a new job in any location, nationwide. Why being too open can backfire From your perspective, this might not entirely make sense. After all, there is a good chance that you're just finishing training and are, in fact, pretty open to where you'll go next. And you certainly don't want to miss any opportunity that might be a good fit, no matter where it might be located. 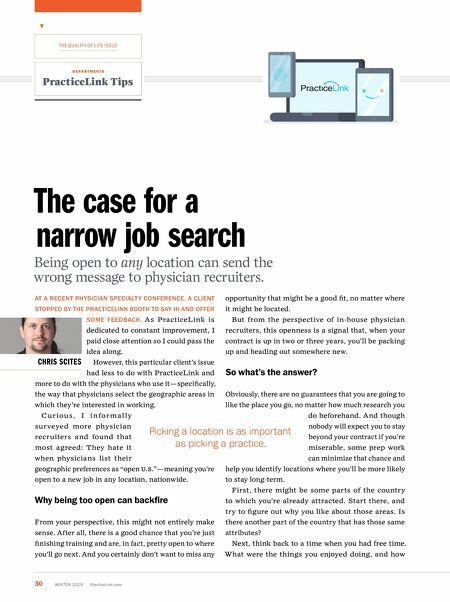 But from the perspective of in-house physician recruiters, this openness is a signal that, when your contract is up in two or three years, you'll be packing up and heading out somewhere new. So what's the answer? Obviously, there are no guarantees that you are going to like the place you go, no matter how much research you do beforehand. And though nobody will expect you to stay beyond your contract if you're miserable, some prep work can minimize that chance and help you identify locations where you'll be more likely to stay long-term. First, there might be some parts of the country to which you're already attracted. Start there, and try to figure out why you like about those areas. Is there another part of the country that has those same attributes? Next, think back to a time when you had free time. What were the things you enjoyed doing, and how Picking a location is as important as picking a practice.